Joeschmo's Gears and Grounds: Finds from the Grind - Where's Dogmeat? Finds from the Grind - Where's Dogmeat? Where was I? I've been waiting for you to break into Fort Hagen for days! 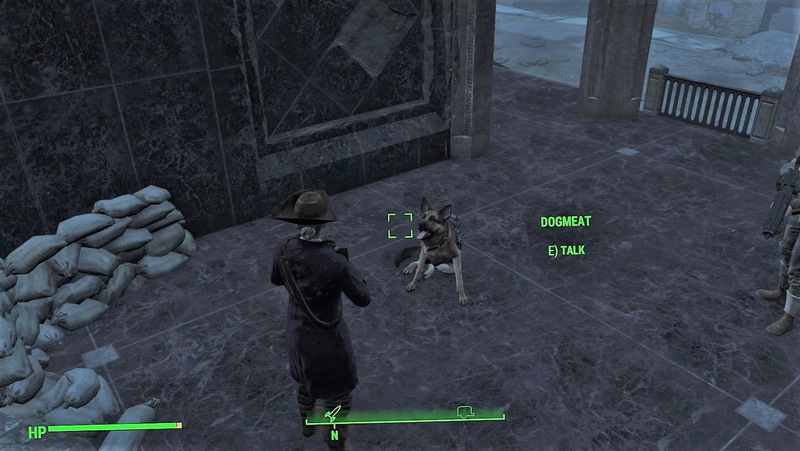 If you've been playing Fallout 4 and wondered why Dogmeat wasn't at the Red Rocket gas station like he's supposed to be, here's the quest glitch that explains why. You have to be in the middle of the main storyline quest "Reunion" after you've followed Dogmeat's nose to Fort Hagen. If you decide not to go in there with him and dismiss him to use another companion to do some other quests, even though the game says he's returning to the Red Rocket gas station near Concord, he doesn't go there. He goes right back to the blocked front entrance of Fort Hagen. To clear the glitch, clear the quest and then he'll go back to the place you dismiss him to afterwards. Finding him in that place has its own problems, but at least you'll know he's somewhere in that settlement.